Classic Sports Cars is a website exclusively devoted to vintage sports car sales. By classic or vintage we mean pre 1973 vehicles. Since there are more cars for sale than we can carry in our inventory, we decided to create this website. Within this website you will find Classic SportsCars for sale. Click on the country of origin for the car you are interested in, and browse the listings. If you find one you like, click on it for the ad, photo and contact information. On these pages you will find more than just listings of automobiles for sale. We will be providing information on these great cars, and telling you what to look for. We will provide you with production figures, give you some pros and cons and a little history of the great classics. 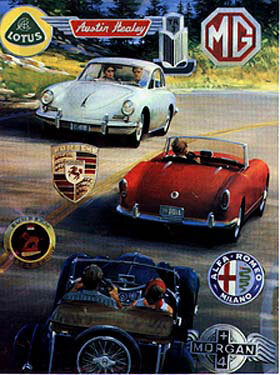 Just click on the manufacturers logo to get some information on these fantastic automobiles.